Godfreys is the largest vacuum and cleaning retailer in Australia, known for its crazy deals on vacuum cleaners, steam mops and accessories. For over 80 years Godfreys have been trusted as the vacuum and cleaning specialists, now with a nationwide service and repair network. Shop online at Godfreys and browse the latest catalogues and weekly ads to score yourself a bargain. 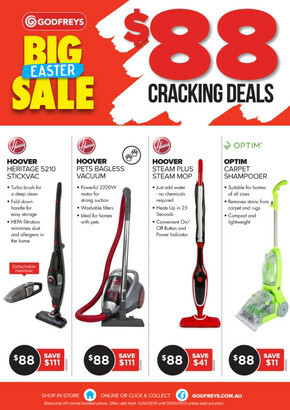 Check out Godfreys online and head over to their On Sale Now section for all the latest bargains on vacuum cleaners and other cleaning products. Whether products are best sellers, on sale or selling for a hot price, Godfreys labels products accordingly to help make choosing your next cleaning product a synch. Sale prices are available online and instore! Make an online order of over $99 (including sale items) and delivery to your home or office is free! All orders also include free tracking. Visit Shopfully app for opening hours, store locations, and to browse the latest flyers for great deals and special offers.